JOIN US for this special girl for food, silent auction & t-shirt sales. Sophie is an amazing 6-year-old girl, who has complex medical needs – to name just a few: Angelman Syndrome, Irretractable Epilepsy, Hip dysplasia, Scoliosis, Optic disc adomaly, tube feed dependence & sensorineural hearing loss. 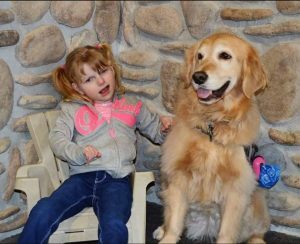 To aid Sophie day-to-day safety & functioning, she was partnered with a highly trained alert dog, Tinkerbell. In a sad turn of events Tinkerbell passed away from an aggressive cancer in May. We are asking for YOUR help in supporting Sophie in getting a new service dog.